"Life in the West is hard enough, living outside the law in the West will make or break you. 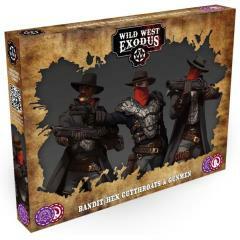 Bandits are armed with a mixture of pistols and rifles and travel from Town to Town causing trouble and taking what they want until the Lawmen catch up with them. These men and women are often tainted by the Hex and their negative passions and emotions are exaggerated by that otherworldly influence. Shunning even those Outlaws that they once called friends, these Tainted band together and are often recruited by more powerful Tainted to fight as their pawns"